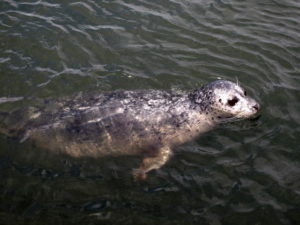 Description: Harbor seals are brown, tan, or gray, with V-shaped nostrils. They have a rounded, spindle-shaped body. Spots or rings are visible on the dorsal surface (backside) and much more sparse on the underside. The body and flippers are short, with a large, rounded head. An adult can reach a length of 1.85 meters (6.1 ft) and a mass of 132 kilograms (290 lbs). Females are generally smaller than males. They are found in coastal waters of the northern Atlantic and Pacific Oceans as well as those of the Baltic and North Seas, making them the most wide-ranging of the pinnipeds (walruses, eared seals, and true seals). Diet: Harbor Seals are carnivorous (meat eater). They primarily prey upon fish such as anchovy, sea bass, herring, cod, whiting and flatfish. They also feed on shrimp, mollusks and squid. Harbor seals do not chew their food; they either tear it into chunks or swallow it whole. Harbor seals are eaten by great white sharks and killer whales. Harbor seals are curious but shy animals that prefer quiet, unpopulated areas. Seals like to “haul out” on protected beaches, spits, bars, rocks and log rafts to bask in the sun and sleep. At the slightest sign of danger they will slip back into the water and swim away. Harbor seals often haul out at low tide to rest, digest food, give birth, or nurse their young. Males fight over mates underwater. Females mate with the strongest males, then bear single pups, which they care for alone. Pups are able to swim and dive within hours of birth, and they grow quickly on their mothers’ milk. The pups nurse for three to six weeks. Females outlive males (30-35 years versus 20-25 years). A fatty tissue called “blubber” keeps them warm. The harbor seal can plunge 300 feet and stay underwater up to 28 minutes. Most harbor seal pups shed a white wooly coat before they are born. The mother nurses the pup with rich milk for three to six weeks. On land, the harbor seal moves by a caterpillar-like motion. It is against the law to disturb harbor seals and other marine mammals.